Setback #1: Pulled laundry from dryer to find I had also laundered the blue ink -pen in one of Paul’s pockets, which broke and blue speckled all clothing and linens. Especially sad for the light gray Anthropologie pants that I wear at least twice a week because I don’t have very many pants. 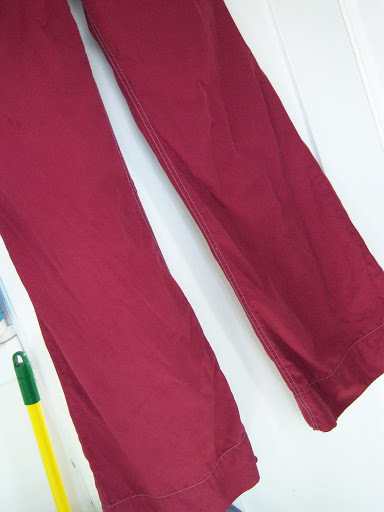 Accomplishment #2: Found three-year-old wine colored RIT dye and dyed said pants. I didn’t want them to be too purpley so I also added a dozen tea bags to brown it up a little. I have no idea if this had any effect. But I think the pants turned out okay, and i’m kind of proud… As long as I can remember not to wash them with any other clothes and avoid ending up with pink clothes with blue speckles.